Connect the items as shown in the illustration below and charge the system. Note: The illustration above shows the UK version of the AC adapter. The recharge LED will go out when charging is complete. 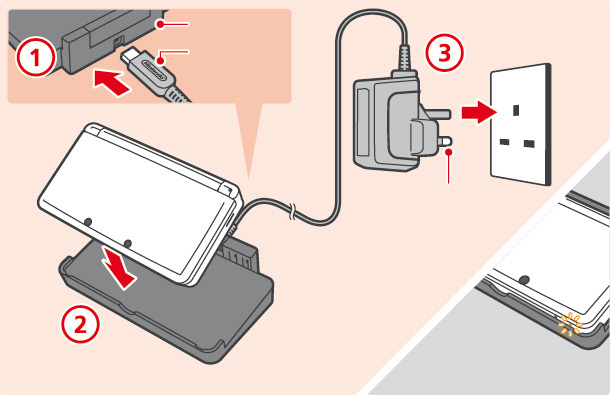 It is also possible to charge the Nintendo 3DS without the charging cradle. Just connect the DC plug of the Nintendo 3DS AC adapter directly to the AC adapter connector. You can also charge a Nintendo 3DS using the Power Supply for a Nintendo DSi or Nintendo DSi XL.